BROOKLYN, NY–Cleveland, Orlando, Washington, Charlotte and Phoneix; that is the order of the top five picks for the 2013 NBA draft. 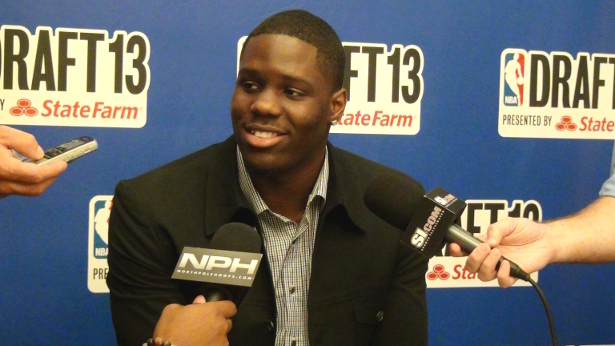 Will Canadian basketball history be rewritten once again with Brampton native, Anthony Bennett in the top three? In the 2012 NBA draft, Tristan Thompson was selected as a top four pick to the Cleveland Cavaliers, currently holding the highest spot ever drafted for a Canadian. The difference between these Canadian top picks is that one (Thompson) came into the league with an established position, while Bennett is thought of as a tweener by most professional scouts. Bennett feels that with continued development, his long term NBA position will be the small forward. A 7’1 wingspan proves to be an asset for him both as a defender and an above the rim scorer, taking away from a lack of height as a power forward. As witnessed in his one-and-done season at UNLV, he is very versatile in scoring having averaged 16 points and 8 rebounds while finishing with authority around the basket, knocking down spot-up shots and even creating for himself on the drive from time to time. Against bigger, lengthier and stronger players at the four in the NBA, this is where the grey area comes into play. Bennett is currently rehabbing his shoulder after a rotator cuff surgery that was done in May. When training camp starts and he is back on the floor, it’s back to the grind where he will be adding to his game from the perimeter and getting more comfortable creating for himself from outside. Moreover, adding to his lateral quickness will be just important to be able to stay in front of more explosive NBA players. At this point it wouldn’t be a surprise [as far as we’re concerned] if Bennett went at number one to the Cavs. His versatility this early in his career, combined with his upside could make him a viable overall first pick. UNLV Foreign Tour to Canada: Win Exclusive ‘Like A Rebel’ T-Shirt!